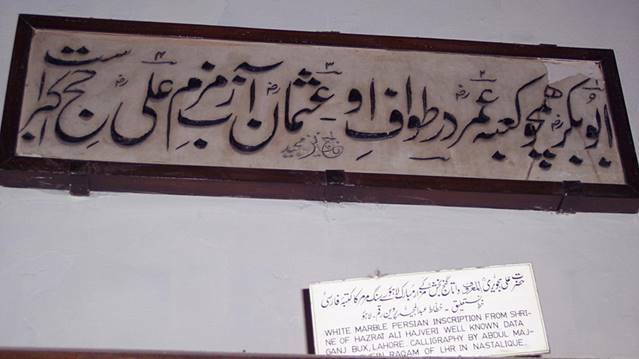 When Hazrat Ali Hajvairi R.A. (Daata Sahib of Lahore) arrived in Lahore upon advice of his mentor, the city was already flourishing with many revered Sufi saints. To test Ali Hajvairi, they sent him a cup of milk that was full of milk to the edge. It was a polite hint that there may not be more room for another saint in Lahore! Ali Hajvairi smiled at their gesture and responded by adding a spoon of sugar in the same cup of milk. Sugar dissolved in milk molecules, sweetening it without raising the level of milk, so it didn’t over flow from edges. When those saints received and drank the sweetened milk, they knew the true patron saint of Lahore has arrived. Daata Sahib’s wisdom was acknowledged by the founding father and greatest Muslim schokar, Dr. Allama Iqbal, read his poem from Israr-e-Khudi here. Today Lahore is sweetened by holy presence of revered saint. Any time day or night, there is langar waiting for poor , needy, beggars, travellers and pilgrims without any question about caste, religions or sect. Nusrat Sahib used to head back to Lahore to perform at the Urs of Daata Sahib no matter whereever in the world he was for concerts. Download Nusrat Fateh Ali’s beautiful tribute ‘Daata Sahib De Kinaray‘. The Tongue – Saying of the Prophet Muhammad S.A.W.